There are a couple ways to test the effectiveness of a healing modality. One is “FDA Approval.” Most Americans buy into this version, where a drug company pays for and runs very selective tests then shows the results to the federal regulatory body known as the Food and Drug Administration. The FDA stamps approval and the procedure or drug enters the marketplace, usually paid for by health insurance which now all Americans are forced to purchase. An informed person should be aware that the reviewers, doctors and administrators at the FDA are in the back pocket of Big Pharma, either receiving direct payouts or having worked for the drug companies in some capacity in the past. It’s the famous “revolving door” of collusion. A second method for determining whether a medicine or a procedure is effective is “the test of time.” Most Americans have been persuaded to ignore the test of time in favor of the false technology noted above. But the test of time is a good one. Traditional Chinese Medicine, including acupuncture, is one of those healing modalities that has passed the test of time as well as some evaluation by flawed Western technology. 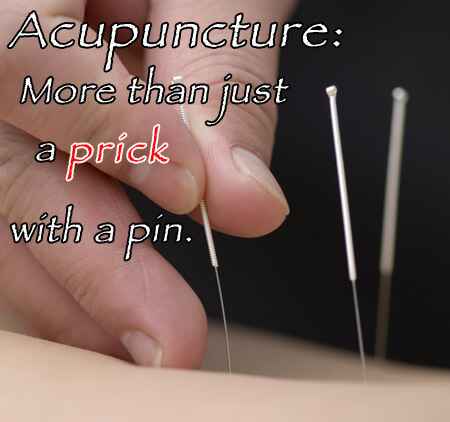 More than a pinprick Acupuncture is one of the most researched and respected of the healing arts. In its fullest sense, it is a complete medical system. It combines herbs, diet, massage and exercise with treatment procedures such as the familiar technique of inserting needles into the body to effect healing. Acupuncture has been used for at least 5000 years and is detailed in the world’s oldest medical text, The Yellow Emperor’s Classic of Internal Medicine. Dating to several centuries before Christ, the text is still the definitive theoretical foundation for the practice of acupuncture. Acupuncture is used to address physical, emotional and psychological problems. The World Health Organization recognizes acupuncture as a viable therapy for over 100 diseases. The theory behind acupuncture is similar in nature to that of all holistic healing arts. Simply stated, a person has a natural, innate healing energy that, when balanced, can return the body to a state of health. In acupuncture and Chinese medicine, the “life force” is known as qi (pronounced as “chee.”) Qi flows through the body along 12 specific channels, or meridians. Along these meridians are over 460 acupuncture points that interface with qi. In order to effect a balanced flow of energy through the body, the acupuncturist uses the insertion of thin needles to either build qi or drain qi. The needles are so fine that there is rarely any sensation of penetration. Stimulating the acupuncture point affects the flow of qi. Health is restored when the energy is balanced. Traditional ways of stimulating the points include the gentle application of heat by way of applying smoldering herbs to the needles while inserted (moxabustion). It has also been found that the points can be successfully stimulated by the application of low voltage electrical current attached to the needles. Different combinations of points are related to various organs or parts of the body. In addition, the profound theories of energetic medicine that comprise the Chinese healing arts guide the trained acupuncturist in delivering the therapy. “You don’t have to have a point, to have a point.” – Harry Nilsson in “The Point” Though acupuncture gained popularity in the United States back in the 1970s, Nebraska did not join the many states recognizing acupuncture as a standalone practice until 2001. In creating the Nebraska Acupuncture Licensure statute, the title and certification of “Licensed Acupuncturist” or L.Ac., was created. This professional designation, overseen by Nebraska Health and Human Services, has detailed and extensive requirements, including that a L.Ac. receive training of no less than 1725 hours in acupuncture at an accredited university or college. However, in Nebraska, medical doctors, osteopaths and chiropractors may legally practice acupuncture with no additional training. M.D.s, O.D.s and D.C.s do not have the designation Licensed Acupuncturist however, unless they went to a four-year Chinese Medical College and fulfilled the 1725 hours of training. Bottom line: If you go to an L.Ac., you are assured they received training in acupuncture. Without the L.Ac., the degree of training is unknown. Traditional Chinese Medicine cannot be understood or defined by the Western medical paradigm. Ancient Eastern science and Western reductionist observation are two completely different models. In my world, I wouldn’t go to an acupuncturist for a knee replacement and I wouldn’t go to an M.D. for acupuncture. Licensed acupuncturists don’t try to do chiropractic adjustments. Why do some non-L.Ac. chiropractors try to do acupuncture? So, although doctors, osteopaths and chiropractors can legally poke a needle in you, only the designation Licensed Acupuncturist certifies that a practitioner has fulfilled the requirements stated in the guidelines. In a perfect world, the kid sacking groceries at the corner market may be the best healer on the planet. But if you want to get stuck with a pin, stick with L.Ac.